Home Beers Bierbrouwerij De Koningshoeven B.V.
La Trappe Witte Trappist | Bierbrouwerij De Koningshoeven B.V. Pours hazy, gold in color with minimal head. Taste is green apple, straw, mineral, and Belgian spices. Heavy bodied for the style, high carbonation, and sweet. Tastes like a witbier/tripel combo. Complex for the style. Good beer. Pours a hazy goldwn color. 1/4 inch head of a white color. Slight retention and slight lacing. Smells of Belgian yeast, pale malt, hint of alcohol, hint of citrus, and a hint of sweet malt. Fits the style of a Witbier. Mouth feel is sharp and clean, with a high carbonation level. Tastes of Belgian yeast, pale malt, hint of alcohol, hint of citrus, hint of spice, and a hint of sweet malt. Overall, light and good blend, but too carbonated. light body, medium light carbonation, and a lightly dry finish. Overall, an excellent brew from a great brewery. One of he best witte ale I have had to date. Pours a hazy golden color with a huge top of white creamy head that disolve very slowly. Aroma is of citrus, banana, zest, spices like corriander and pepper and wheat. The taste is fruity and medium sweet with a medium spicy bitterness and some notes from the wheat in the back. The finish is as well medium bitter with some good spicy notes, but the flavour and mouthfeel is a little watery. Medium body with a high carbonation, with a clean and smooth but a little watery mouthfeel. A good and refreshing witbier that would suit well on a hot summerday. 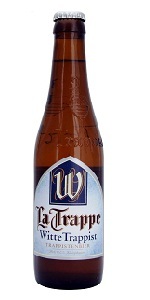 La Trappe Witte Trappist from Bierbrouwerij De Koningshoeven B.V.